The Brokk 170 with SmartPower — the company's signature intelligent power management system — offers 15 percent more power than its predecessor, the Brokk 160, but retains the same compact dimensions. 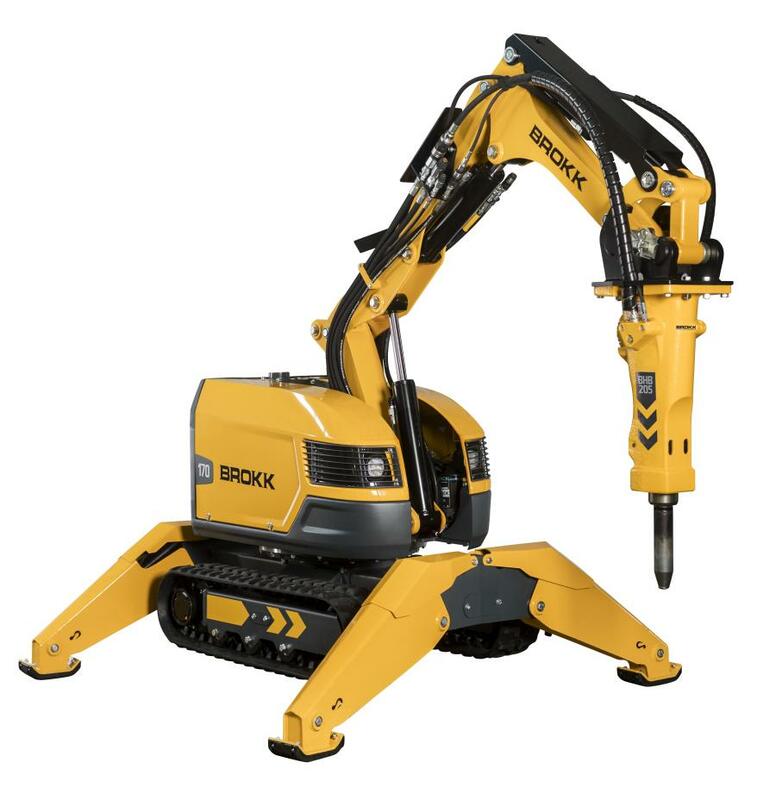 The Brokk 170 is one of four new next generationBrokk remote-controlled demolition machines Brokk launched at World of Concrete 2019. "Contractors work in some of the most confined spaces, and to get their jobs done successfully they can't sacrifice power or safety,"said Martin Krupicka, president and CEO of Brokk Group. "That's why maintaining the same footprint as the former model and boosting the machine's power was a must. This new machine truly tests the limits of compact power." The Brokk 170 incorporates the SmartConceptsystem, which ensures improved performance and uptime. SmartConcept consists of three features: SmartPower, SmartDesign and SmartRemote. SmartPower senses when the power supply is poor or faulty then compensates before damage to components occurs. This allows contractors to use the machine with generators or unreliable power sources. SmartDesign extends machine life and provides unprecedented ease of maintenance due to 70 percent fewer cables, hardened components, LED headlights and easily accessible grease points and hydraulic hoses. An ergonomic remote-control, the SmartRemote, incorporates adjustable straps, intuitive controls and professional-grade radio technology with a 984-ft. (300-m) working range. Brokk equips each Brokk 170 with a452-lb. (205-kg)BHB 205 hydraulic breaker, todeliver 299 foot-pounds (406 joules) with each blow. The machine can be paired with a wide variety of attachments for added versatility, including buckets, clamshell buckets, concrete crushers, grapples and metal shears. As with all Brokk machines, the Brokk 170 offers superior reach and movement. The three-part arm extends to 16 ft. (4.8 m) vertically and 14 ft. (4.4 m) horizontally. The machine also features 360 degrees of continuous rotation for optimal versatility on the job site.